Here's a closer-up shot of the new boy in town. 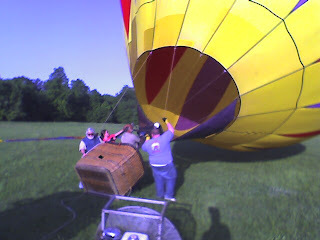 Since I've begun to crew for a balloon-pilot colleague, I've become interested in this sport. I've been doing a little research. So, having grown up in southeast Nebraska, about 10 miles from Bruning, I was surprised to learn of a significant event that occurred there in 1960. The equipment used in modern hot air ballooning was first demonstrated outside Bruning by Ed Yost (who coincidentally died just a few weeks ago [No! Not in a balloon wreck!].) He was the first to use an airborne heater to keep the balloon aloft. Of course, hot air ballooning had been around for almost 200 years at that point. The advent of a portable mechanism to keep the air hot allowed the pilot to maneuver in the vertical plane, and the sport received a shot in the arm. Currently there are, according to My Favorite Site in the World, 7500 balloons in the US. I found it somewhat ironic that Southeast Nebraska would be involved in the revival of a sport which, as far as I know, has almost no participation in that part of the world. I don't recall ever seeing a hot air balloon as a kid. Someone, please correct me if I'm wrong about the dearth of ballooning in SE Nebr. Ahh...Bruning. I have fond memories of Pastor Thomas Damrow, who shepherded the flock Trinity Lutheran Church in Bruning during my childhood there. God bless you, if you're out there, Pastor. While leafing through the Plain Dealer this morning, I came across an unusual spot. Seems there's a tribe of 350 or so in Brazil with an actual "primitive" language. As a student of linguistics, I have long accepted the claim that no language is primitive, that is, any thought can be expressed in any language. Building from these assumptions, smart folks like Noam Chomsky have tried to distill what the common denominators are to all human languages: Which features of human language are "hard-wired" in our brains from birth? What allows us to acquire language and use it to express abstract thought? They have claimed for several decades that certain universals are found in every human language, or shall we say, almost every human language? The language of the Pirahã tribe of Brazil reportedly lacks some of the "universal" constructs we'd expect to see in a language. According to Der Spiegel, one of these missing constructs is recursion. In English recursion is rendered using subordinate clauses. For example: "This is the dog that bit the man who came to our door." (Relative pronouns underlined, subordinate clauses in italics.) Clauses modify and describe each other, so in the end the full meaning of the discourse is dependent upon its context. The chief expert on the Pirahã language today is Daniel Everett, who not surprisingly has been working among the tribe as a Bible translator. It may be that his analysis is incorrect or incomplete. Others apparently have been dispatched to test his claims. The Plain Dealer article (sorry, no link available as of this writing) mentioned that current traditionalists had regarded Everett's claims as "putative" and insufficient to revolutionize the study of human language. I hope that Everett is not being dismissed as a lightweight because of his work as a Bible translator. In the end it may be that the Pirahã language will serve to advance the claims of the thought-depends-on-language school--those who claim, "You cannot conceive in your mind what you cannot find words for." I don't know. Something in my world view seems to reject this idea...e.g. God, Trinity, infinity. But I must admit I could stand to learn from those who've dedicated much effort in the field. My, how our family has grown! We are proud to announce the birth of Coleman Steven on June 12, 2007. Here's the first official picture of "the boys." Praise the Lord for his blessings! Email address protected by reCAPTCHA. Click to reveal.